I had another successful week following the menu plan. The only change I made is barely worth mentioning: I substituted coleslaw for cucumber pickles when I discovered half of a cabbage in the produce drawer. Last week’s new recipe, Garlic Tofu with rice, was a hit with all of us, and I think our favorite of the three vegan recipes I tried this month (we liked them all though). This coming week is the last in February, and as I’m still not missing meat, eggs or dairy I’m going to continue with eating vegan for another month . . . for the most part. I have decided however to add back in seafood and honey, if I want it. I have no plans to rush out and stock up on either item, or include it in my daily eating, but it’s hard to live in Hawai’i and not be able enjoy all the wonderful fresh fish that’s available. I admit to craving a good fish taco ;-). Likewise, honey occasionally appears in items that would otherwise be vegan, and it just doesn’t make sense to me to refuse to eat something over a tiny bit of honey. 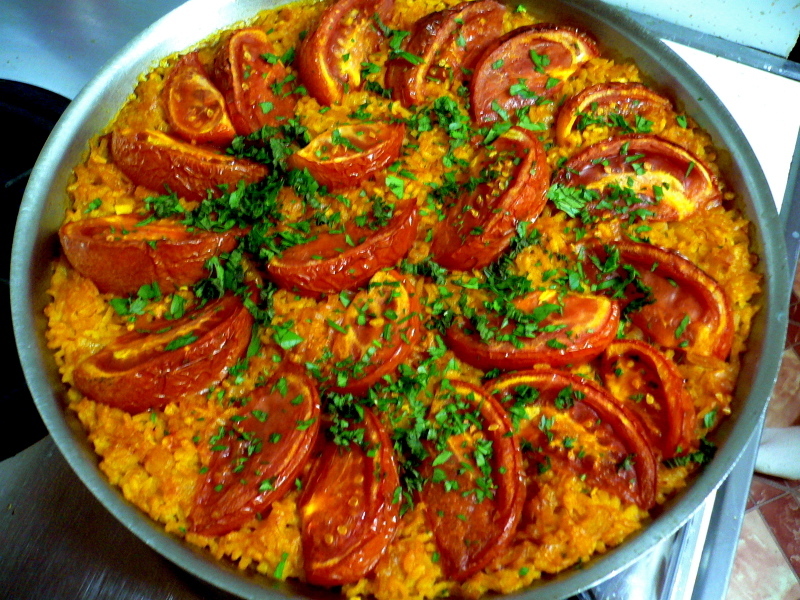 Monday: Mark Bittman’s Paella with tomatoes; sautéed Swiss chard. The paella will be made with vegetable broth, and the chard sautéed in olive oil with some garlic. Tuesday: Ginger-pork pita sandwiches with cucumber pickles; Asian chopped salad. I’ll be substituting sesame-peanut noodles for my sandwich. Wednesday: Spaghetti with marinara and grilled Italian sausages; garlic bread; green salad. I’ll have one of my vegan sausages. Thursday: Slow cooker chicken adobo with bok choy and steamed rice. Carrot ginger soup and vegan egg salad sandwich for me. Friday: Barbecued pork ribs; stuffing; cucumber pickles. I’m going to make the stuffing with vegetable broth so it’s vegan, and I’ll probably have some vegan meatballs. Saturday: Crispy baked tofu with spicy dipping sauce; vegetable spring rolls; soba salad. Sunday: Vegetable sukiyaki, steamed rice. Without the meat sukiyaki is vegan (and still very delicious!). Fingers crossed again that it all works out. I’ll be offline for the next week or so, and for now plan to keep posting our weekly menu plan when I come back. We’re enjoying a particularly gorgeous day here today – blue skies, light breeze and warm air – so Brett and I are heading to the beach in a little while for a couple of hours of relaxation and sun. The girls have a lot of homework, so they won’t be going along today. I plan on posting the coming week’s menu tomorrow, but after that will be taking a short break from blogging for a week or so. 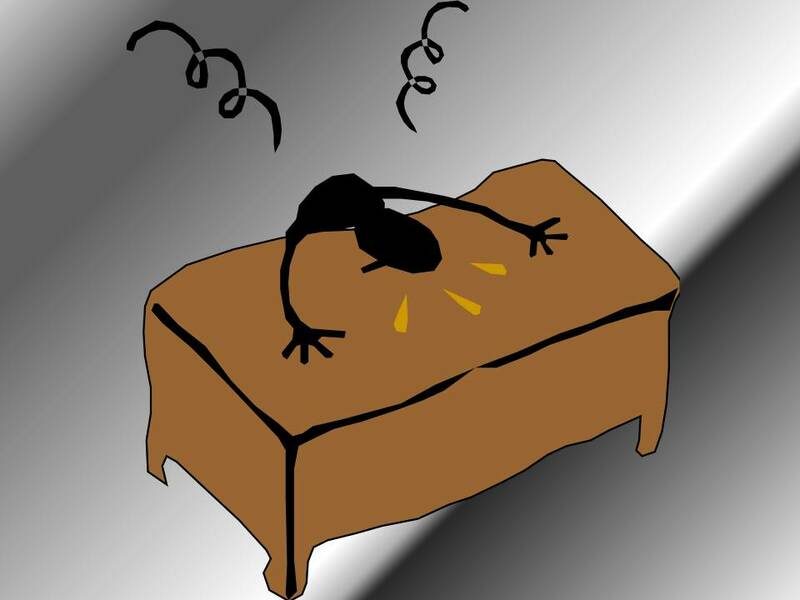 Once again I need to stop and figure out for myself why I am blogging and what I have to say. I feel like I’m losing focus once again, but usually a week or so of reflection helps me center my thoughts, recharge, and get back on the path. I hope you’ll stick around – I’ll be back! Reading: I’m still reading and enjoying Live By Night, but have also started reading a book YaYu thought I would enjoy: Stick Figure, by Lori Gottlieb. It’s her diary about being diagnosed with anorexia nervosa when she was just 11 years old. It’s well-written and an entertaining read so, but I haven’t really gotten all the deep into it yet. Listening to: The girls are already back in their room and studying, and Brett left early this morning to do some trail maintenance, so it’s very, very quiet around here right now. Watching: I can hardly believe that tonight will be the penultimate episode of Downton Abbey. I am in total denial right now that it won’t be back next year. Otherwise it’s been an eclectic week of watching for Brett and me. We watched The Monuments Men on Amazon one night, then a British series on Netflix called Run for the next three nights. It was bleak, but compelling. Last night we all watched The Martian, which we all thought was excellent (although I still prefer the book). Cooking/baking: Breakfast for all of this morning was apple strudel we bought yesterday at Costco (it’s vegan!). This afternoon I’m going to bake a triple chocolate fudge bundt cake (not vegan), and dinner tonight will be sloppy joes (made with a ground beef substitute), cole slaw and corn chips. Happy I accomplished last week: We finally got the freezer defrosted, although all the credit for the actual deed really goes to Brett. We also got our Costco shopping done for the next three weeks. We didn’t buy very much because we’ll be on our Mystery Vacation™ the last week of our food-shopping month. Looking forward to next week: I’m getting my hair cut tomorrow – yeah! I cannot get over how quickly my hair grows here. I used to be able to go six or seven weeks before needing it cut back on the mainland, but here I am shaggy in just four weeks. Our house is also getting sprayed for bugs tomorrow – another yeah! We rarely see any bugs here, but our current landlord is very proactive about these things, where our last landlord could have cared less (and we were almost overwhelmed at times with insects in the house). There’s not a whole lot else going on around here otherwise next week other than the usual chores and errands. Grateful for: I’m very thankful that Brett took on the job of teaching our children how to drive. It’s just one of those things that I do not have the temperament for, but he’s been very patient with all of them. YaYu drove us all to Costco and back yesterday and did a fantastic job, which reflects on the good job Brett has been doing with her (she’ll take her driving test after school finishes in May). In the same vein, I’m also grateful for everyone who helped teach my children to swim, something else I never could have done. Bonus question: What social media platforms do you use? I’ve been on Facebook for almost seven years and am a fairly heavy user. I especially enjoy it as a way to stay connected with friends and family that live far away, or that I don’t get to see very much. It’s been a terrific way for our son and daughter-in-law to share information, photos and conversations with us about our grandson. If I have a complaint it’s that there seem to be so many links to articles, political and otherwise, posted these days. Sometimes they’re interesting, but I really don’t have time to read all of them. I much more enjoy pictures and anecdotes that let me know what friends are doing. I’m also a heavy user of Pinterest. I just collect photos of things I like, but have somehow managed to acquire nearly 35,000 followers, and am I’m honestly still not sure how that happened. Finally, I’m also on Twitter, although I rarely tweet because I am awful at doing short and pithy, and I have no followers (and don’t care). I mostly use it to read quick updates about what’s going on in the world, and to find out what’s going on out in town. I’ve been thinking of joining Snapchat as another way to stay connected with the girls while they’re away at school, but haven’t done it yet. And, of course I read and follow several blogs! How was your week? How is your Sunday afternoon going? 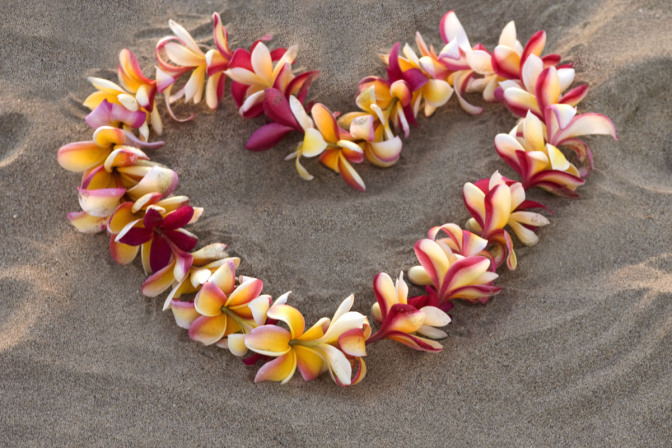 I honestly didn’t think living on Kaua’i could get any better, but on the way out of the hospital the other day following my mammogram I stopped in the hospital gift shop to check it out. They sell See’s candy! Those of you from the west coast will know exactly why this discovery was so exciting, but for those who don’t know See’s, they are simply The. Best. Candy. Ever. Anyway, last Saturday I went to buy some for Brett and the girls for Valentine’s Day, but the gift shop was closed :-(. 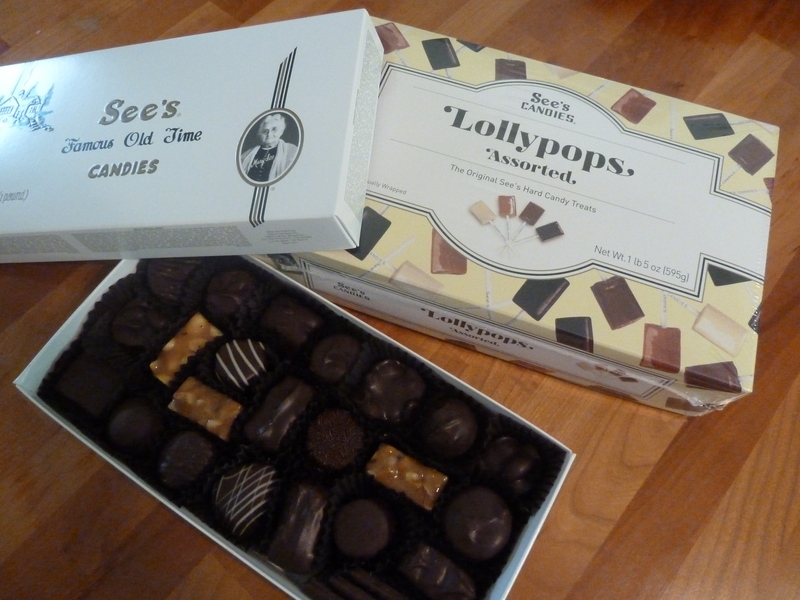 Brett and I stopped in on Wednesday though and I had him pick out a box for himself – he chose the dark chocolate assortment – and we decided on the lollypop assortment for the girls. I can’t tell you how happy it makes me that See’s is available here . . . even though I won’t be enjoying any of it for the time being (none of it is vegan). The freezer was (finally) defrosted! Our annual rebate check arrived from Costco, and was quite a bit more than we were expecting. Our federal tax refund check also arrived, less than three weeks after filing online. We decided to forego the $29 option to have it direct deposited, so were not expecting to receive anything until next month some time. We put $17.78 in the change/$1 bill jar this week. We found another beautiful $5 plant for the lanai at the farmer’s market. And . . . I have ridden the exercise bike three times every day for the past week, putting in over 70 miles, and burning more than 2800 calories! All this goodness will be rolled into tortillas for our Cuban-style burritos. Last week’s menu went according to plan, and the two new vegan recipes I made, crispy orange ginger tofu with broccoli and drunken noodles, were both hits and will appear on the menu again some time in the not too distant future. In spite of all my efforts though our freezer did not get emptied enough to defrost it, so this week’s menu plan incorporates as much as possible of what is left so that we can go ahead with the Great Defrost later this week. Three out of seven days are full vegan meals, with other days easy to adapt or make substitutions. The garlic tofu with rice is this week’s new recipe. I’ve also been enjoying chia puddings made with either soy or almond milk the last couple of weeks. I’ve made vanilla, matcha (green tea) and chocolate puddings, and all are delicious as well as a great way to add protein and fiber to my diet. I usually serve a small bowl of the pudding with a swirl of agave syrup and add some fresh fruit on top. WenYu loves to eat it too, so it doesn’t last long! Monday: Slow cooker chicken pho. I cut the spices in half when I make this (otherwise it’s almost like Christmas potpourri) and cook the noodles outside of the slow cooker because we’ve found they fall apart otherwise. I’ll have sesame-peanut noodles (yum!). Tuesday: Spanakopita, hummus, pita bread, dilled cucumber salad. I’ll have everything but the spanakopita, which contains feta cheese. I’ll probably add some sprouts and make my hummus, pita and cucumbers into a tasty sandwich. Wednesday: Grilled steak, french fries, steamed green beans. I’ll figure something out for me, probably some kind of soup. Thursday: Cuban burritos, salad. 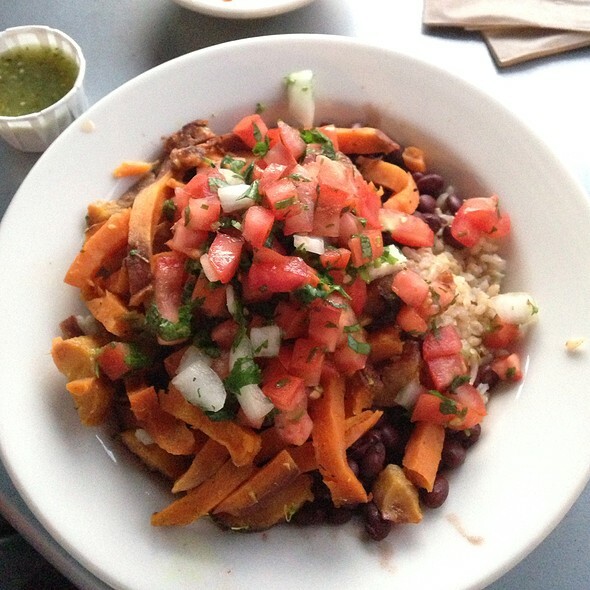 The burritos are filled with yellow rice, cuban-style black beans, roasted sweet potatoes and fried bananas, and topped with pico de gallo style salsa. Friday: Breakfast for dinner (scrambled eggs, sausage, toast and fruit). I will be skipping the eggs and having vegan sausages. Saturday: Garlic tofu with rice, grilled bok choy. This recipe has been calling me for a long time, even before I started eating vegan. Sunday: Sloppy joes, refrigerator cucumber pickles, corn chips. The sloppy joes will be made with a vegan ground met substitute, so I’m good to go with this meal. We’ll see how it goes – we hope to be defrosting that freezer no later than Thursday! Hau’ole la aloha! Happy Valentine’s Day! I had a special treat planned for Brett and the girls today, but when I went to pick it up yesterday the store was closed! Sigh. They understood and said they are willing to wait for their surprise, so I will get back to the store sometime later this week. In the meantime we plan to relax and enjoy the three-day weekend. Brett told me yesterday that I am to give up all thoughts of ever planning another Mystery Vacation™ – the suspense of this one has gotten to him, and he is tired of waiting to find out where we’re going (although I have my suspicions that he might have figured out our destination). The girls like it that it’s still a mystery. I have a great idea for another Mystery Vacation™ in late 2017, but we shall see if I will be allowed to do it again. Reading: I finished The Given Day on Thursday, and have started the second book in the series, Live By Night. Lehane continues with some of the same characters, and starts the book with one of them on his way to being murdered gangland style, so I’m looking forward to seeing where this book goes, especially since the third book in the series has been rated so highly (i.e. one of the best books of 2015). Listening to: We’re all knocking around right now pulling things together so we can head to the beach. Otherwise it’s been a very quiet morning around here. Watching: There will be more Downton Abbey tonight of course, but Brett and I have been watching Happy Valley this week, another British crime series on Netflix. The acting is very solid, and the storyline is gripping. I read there is another season; I already can’t wait until that’s available. This past week we also watched Meet the Patels and totally enjoyed it. Our favorite line was when the parents, who have been married for 35 years, both said that their spouse still keeps trying to change them after all this time. We could identify with that! Cooking/baking: The girls will be fixing cheeseburger pie for dinner tonight. I will have a few of the french fries they’re also fixing, but I’m going to have a bowl of lentil soup instead of some pie. I baked brownies the other day for WenYu’s birthday and there are still plenty left, so no baking going on today. Happy I accomplished this week: I had nothing on my agenda this week other than picking up the Valentine’s Day surprise and that didn’t happen. We also didn’t get the freezer defrosted – there are just a few too many things left that we can’t fit into the freezer in the house. So I really didn’t accomplish anything special this past week. We didn’t even make it to the beach (we’re going today though), although the weather was fantastic, but the days we had the car we were busy with errands, and the other days the girls had the car and we were stuck at home. Looking forward to next week: Besides getting everyone’s belated Valentine’s Day treat, does going to Costco count? We are really running low on things due to preparing for the Great Freezer Defrost, so I’m sort of looking forward to restocking stuff. I’m also dreaming of another day at the beach, but it’s supposed to rain all week :-(. Grateful for: I am so thankful I decided to go ahead and buy my son the Star Wars Death Star waffle maker for Christmas. I worried that it was too silly a gift as well as too much of a splurge, but he and our grandson have made Death Star waffles together every weekend since they returned to Japan and their conversations (as reported on Facebook) are so funny, and warm my heart. The waffle maker was the perfect gift, and money well spent. Bonus Question: Do you have a special skill that most people never get to see? I thought of this question when I kept dropping things in the kitchen the other day. I can honestly make a mess out of anything. I’m the person that drops the greasy spoon on the floor, or has the toast land jam side down, or spills marinara sauce on the clean white shirt I just put on less than 30 minutes earlier – if there’s a mess to be made, I’m going to make it, especially if I just finished cleaning things up. On the other hand, I don’t lose socks in the washer, and never did. But, that’s more a superpower than a special skill. I hope you are all enjoying a lovely and relaxing Sunday afternoon. What are you doing for Valentine’s Day? How was your week? Happy birthday to WenYu! 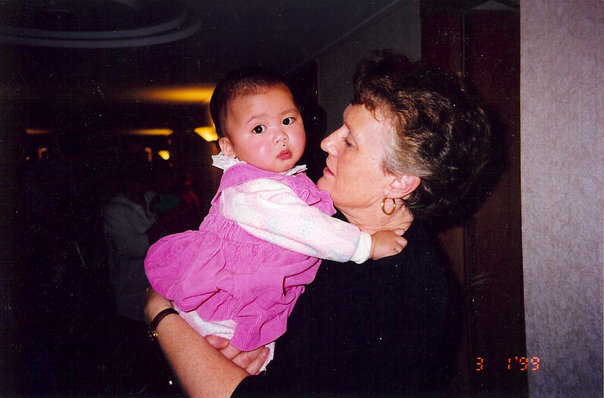 I almost can’t believe that the beautiful little girl I held for the first time nearly 17 years ago is grown up and almost ready to leave the nest. Where did the time go, and how did it go so fast? 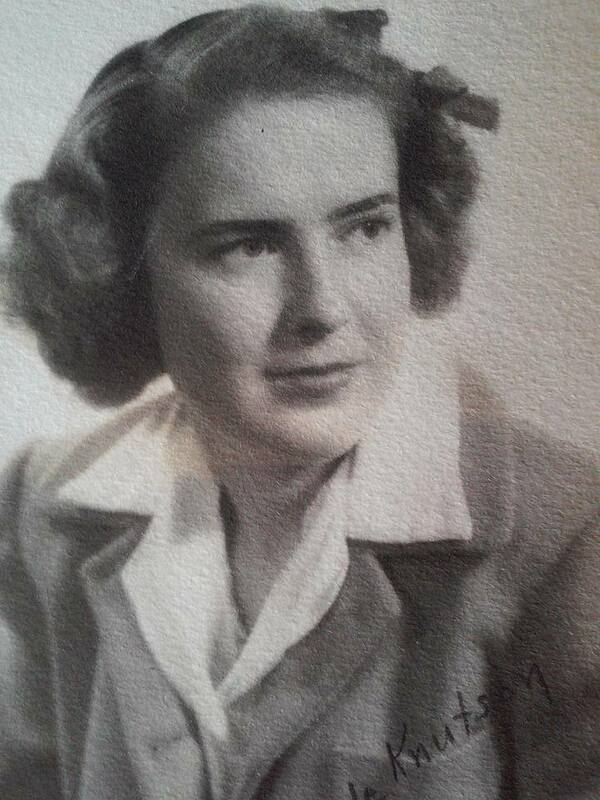 It’s been a quiet but otherwise good week in spite of receiving not entirely unexpected news about my mom’s health. She is hanging in there, but changes are coming. 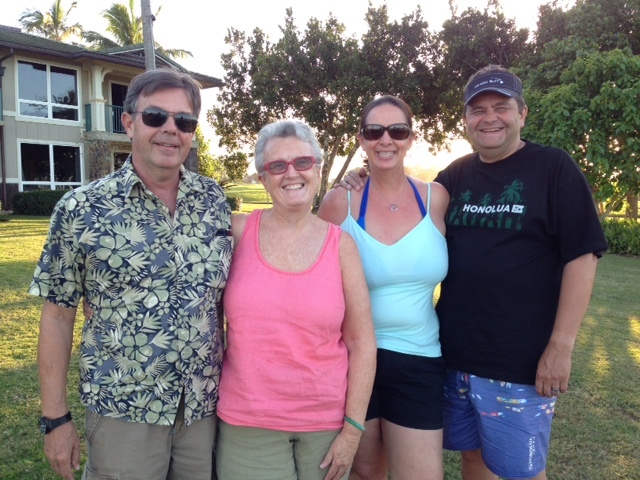 And, we had a terrific dinner and visit with Denise and Jim on Tuesday evening. I already can’t wait for their visit next year! I did two 15-minute bike rides every day. The girls’ school announced they will pay $10 of each AP exam, which will save us $50. Also, the swim banquet has been cancelled, saving us another $80. We put $12.60 into the change/$1 bill jar. The weather has been fantastic all week. Gong Xi Fa Cai! Wishing you prosperity in the coming year! The lunar new year, or Chinese New Year, began yesterday, February 8. Celebrated in all countries and territories with significant Chinese populations, the Lunar New Year is the major holiday of the Chinese year. Not only are family and ancestors celebrated, but Chinese deities are as well. And, just as Christmas is associated with special foods, colors and traditions, so is the Lunar New Year. The primary color for celebration is red, but anything gold or resembling gold (representing good fortune and prosperity) is also used in abundance. There are also long lists of traditional do’s and don’ts for the New Year, such as eating fish or oranges on the first day, or not sweeping your house or washing your hair during the first two days. When our girls were little, they always wore traditional Chinese dress for the New Year, but these days they are happy just to get their hongbao, or “lucky red envelope.” These small envelopes always contain money, and are given by family members to all unmarried children. 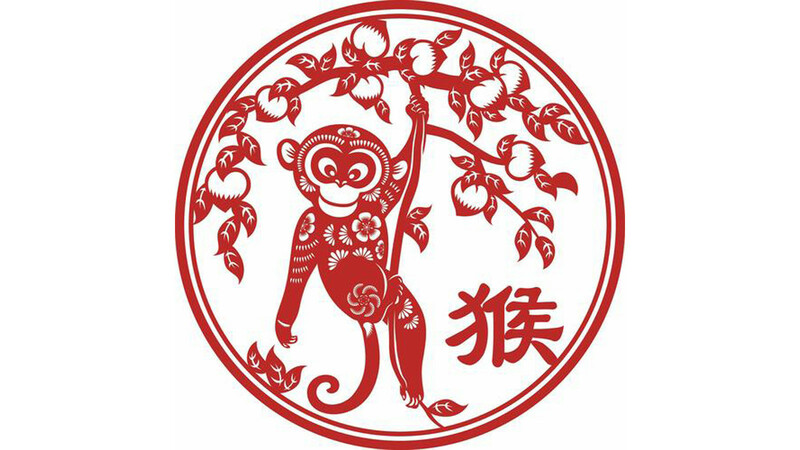 2016 is a monkey year, the ninth animal in the Chinese zodiac. Although people born in a monkey year are considered to be lively, generous, sociable, quick-witted and innovative, monkey years are believed to be the most unlucky in the Chinese calendar. Monkey years are not considered advantageous for making big financial decisions for most people, but those born in sheep, ox, snake or dragon years should do well, as those animals get along well with monkeys. Ironically, those born in a monkey year are not predicted to fare well (supposedly those born with the same zodiac sign as the year’s designated animal will have a particularly difficult year) as are those born in rabbit, tiger and pig years. Brett and I will hopefully break even. He was born in a tiger year, but I’m a dragon. Hopefully my good fortune this year will counteract any bad that comes his way. Xian Nian Kuai Le! Happy New Year! Welcome the Year of the Monkey! Well, last week went exactly as planned, but I’m not entirely sure I can repeat my success this week . . . we’ll see. We have two special family events going on this week: Chinese New Year today and WenYu’s birthday on Friday, with special meals planned for both. We’re also hoping to get together for dinner on Tuesday with friends Denise and Jim up where they’re staying, but still have to coordinate with them about what we’ll be having (and what the girls will have at home). I’m also going to try out two new vegan recipes this week. Both contain tofu, but our whole family likes it so I don’t think it will be a problem because both recipes sound delicious. I’ll personally be having a LOT of tofu this week. 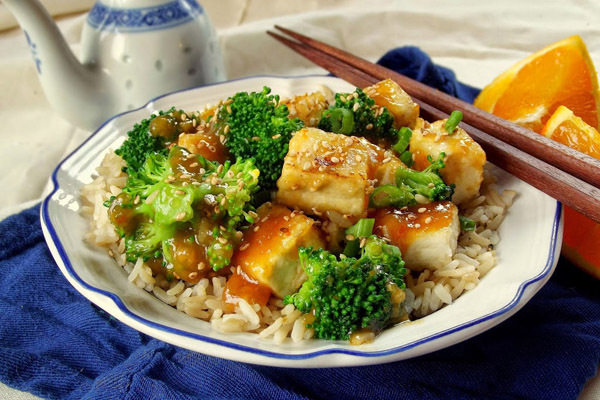 Monday: Crispy orange ginger tofu with broccoli; steamed rice. This looks delicious and the orange sauce makes it a good fit for the Chinese New Year. Oranges are traditionally served at CNY because the word for orange sounds like “wealth” and the bright orange color symbolizes gold and is auspicious for bringing good fortune. Fresh, locally grown broccoli was at the farmers’ market last week. Tuesday: ??? We’ll be hopefully getting together with D & J tonight and will have a plan for what we’re having by dinner time. Wednesday: Barbecue pulled pork sandwiches and cole slaw. I will simmer some fried tofu in barbecue sauce for my sandwich. Thursday: Grilled teriyaki chicken; zaru soba; cucumber salad. I will substitute hiyayakko (chilled tofu) for the chicken. Friday: Macaroni & cheese; green beans. It’s WenYu’s birthday and this is what she requested. I’m not sure yet what I’ll have. I’ll also bake a chocolate cake of some kind. Saturday: Drunken noodles with tofu and peppers. This is another new recipe that I’ve been dying to try out. It looks delicious, and we all love noodles. Hopefully it won’t be too incredibly spicy (I will probably leave out the Thai chili – they are HOT). Sunday: Cheeseburger pie; French fries; salad. I will have a bowl of lentil soup and some of the fries and vegetable.